The Iditarod Trail, a symbol of frontier travel and once main artery of Alaska’s winter commerce, served a string of mining camps, trading posts, and other settlements founded between 1880 and 1920, during Alaska’s Gold Rush Era. The Alaska Gold Rush was an extension of the Western mining frontier that dates from the California gold discovery in 1848. In each new territory, gold strikes had caused a surge in population, the establishment of a territorial government, and the development of a transportation system linking the goldfields with the rest of the nation. Alaska, too, followed through these stages. With the increase in gold production, the non-Native population boomed from a recorded 430 in 1880 to some 36,400 in 1910. In 1912 President Taft signed the act creating the Territory of Alaska. At that time, transportation systems included steamship and steamboat lines, railroads, and four major cross-country dogsled winter trails. Of the latter, the longest ran for Seward to Nome and was called the Iditarod. 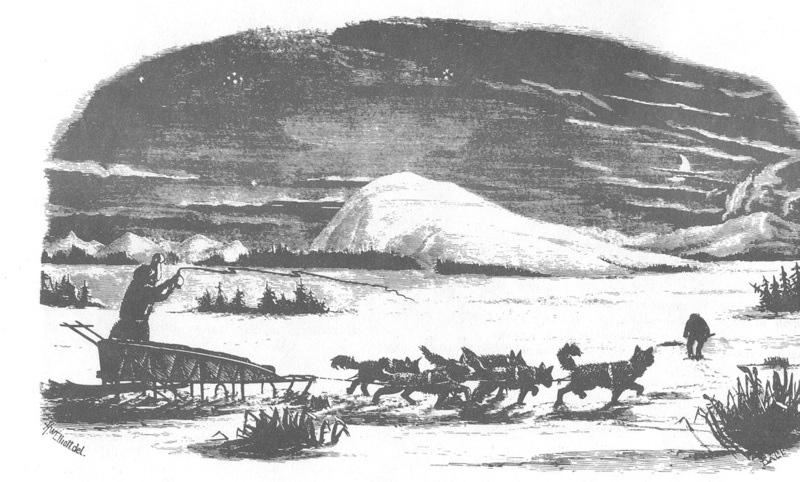 The Iditarod Trail was developed as a response to gold rush era needs. Its antecedents were the Native trails of the Tanaina and Ingalik Indians and the Inupiaq and Yupik Eskimos. They knew the route and had developed winter modes of travel; the dogsled and snowshoe. The peaceful collaboration of Native groups with the newcomers made settlement easier. Our stereotyped image of the parka-clad musher behind a sled and string of dogs reflects a mixture of Native technology and European adaptations. The Native sled was built to carry all the owner’s possessions from camp to camp or from camp to village. The owner ran in front, guiding his dog team along unimproved trail. The Russian, Lt. Zagoskin, wrote in the 1840’s that the Russians introduced the method of harnessing the dogs single file or in pairs in front of the sled. The Russians also introduced the lead dog or “leader” –the best trained dog that kept the others in line and recognized voice commands for direction. During the Russian era, guide—poles and later handlebars were attached to the rear of the sled to direct, push, and balance the weight. 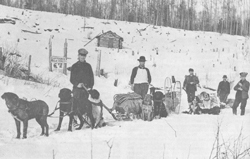 The Russians also developed parts of the later Iditarod Trail as a route of supply and provision for fur trading posts. The Russian American Company sent fur trading expeditions across the Kaltag Portage to Nulato on the Yukon River, along a section built later as part of the Iditarod Trail. When the American fur trading companies took over the Russian posts (after 1867), they continued using the Kaltag Portage and extended it as part of the Yukon River Trail, linking fur trading posts into Canada. From there came French-Canadian traders and trappers, along with their voice commands for dogsledding: Americanized as gee for ye (go right), haw for cha (go left), and mush for marche (go ahead). Thus, the modes of travel and an emerging pattern of transportation were developed, aiding the movement north by the time of the first gold strikes. Alaska’s gold rushes occurred after the other Western states had passed beyond their frontier mining eras. As those frontiers closed, parties ventured north to prospect, to trap, to trade. These freebooters came north fro the industrializing mines of Montana, the Black hills, from the search of an Eldorado or enough of a grubstake to continue his itinerant lifestyle. These were miners after the California fashion, who had moved up the Pacific coast with the series of strikes: into the Cassiar, then into Juneau, and, during the 1880’s, some crossed into the Yukon. There the particular conditions of geography and the Arctic climate changed the familiar patterns of the mining west. Dogs and sleds replaced the burro, sourdough replaced Johnny cakes, and cigars (with their mosquito deterrent) replaced the plug and chew. The first mining area to develop along the future route of the Iditarod Trail was the Cook Inlet country. The glacial Kenai and Chugach ranges cut long the Inlet’s eastern shores creating numerous bays and arms. In a few of the streams pouring into the ocean, gold had been deposited into rich pockets. Russians and early trader/prospectors found traces of gold, but the first major find did not occur until the 1890’s. In 1891, Al King, a veteran prospector from the interior, working with gold pan and rocker, located gold on Resurrection Creek, a steep-graded stream flowing north into Turnagain Arm. A secretive sort, King kept his find quiet until 1893. That year the prospectors and traders followed the usual practice of establishing a mining district, creating rules for claim ownership, and electing a recorder. The Turnagain Arm Mining District boomed in 1895-1896. News of rich finds on the tributaries of the Six-Mile, Resurrection, and Glacial Creeks drew a reported 3,000 people into Turnagain Arm. Most arrived by steamship or sailing vessel, precariously navigating the treacherous tides of the Arm in order to dock at the log cabin communities of Hope and Sunrise. Several hundred other miners took the Portage Glacier route. Steamers from Juneau and Sitka unloaded their passengers in winter at Portage Bay, where the miners had a 15-mile trek across a glacier, the frozen Placer River, and the frozen Arm to Sunrise. Here miners were introduced to the hardships of Alaska winter travel -- some froze on the glacier, others starved while lost in “white-outs,” and a few drowned in the Arm. Sunrise, Hope, and scattered trading posts at Resurrection Bay, Knik Arm, and the Susitna River were connected by roughly blazed trails. Miners and merchants combined to build a wagon road from Sunrise up Six-Mile Creek along the mining claims. Like their counterparts on the Yukon, miners in Southcentral Alaska were adapting to the northern climate. Prospecting followed the cycle of seasons. In the fall, after freeze-up, they hooked up their dogs and pulled their Yukon sleds loaded with a year or two of supplies up the Kenai, Susitna, Knik, or other rivers, then established camp at a promising location and spent the winter thawing ground and digging gravel. At spring break-up, with plenty of water, they sluiced the hoped-for gold from pay dirt. At season’s end they built rafts or poling boats and floated back downstream to the trading posts or towns. In this way, the land was prospected. As goldfields were found to the north in the Talkeetna Mountains and the Yentna River drainage, the network of trails was extended. The illustration on the right is a correct reproduction of the only ALASKA FREIGHT sled on the market. The seller claimed: "This is made from a pattern furnished by the gentleman who took the United States census in Alaska, and is a reproduction of the one that he used in travelling thousands of miles when taking the census, and in which he carried his outfit and provisions. The sled is much larger and stronger than the "Yukon Miner's" sled. It is made entirely of oak, and at the joints, instead of being riveted, it is mortised and lashed with rawhide so that there is not the same liability of breakage as there would be if bolted together. The top hamper is made of oak interlaced with rawhide and tarred marline. This sled is not an experiment. It is the kind the natives use, and will be found invaluable for transporting all kinds of merchandise. It is intended to be used for a dog team or to be hauled by hand. The weight is approximately 73 pounds. It's carrying capacity varies from 1,000 to 1,500 pounds, according to the material transported. We are the only manufacturers of this kind of sled . The greatest impetus to Alaska mining occurred, not in Alaska, but in the Canadian Klondike goldfields. After gold was discovered there in 1896, the stampede in 1897-1898 brought an estimated 50,000 souls to the north. Many never reached the Klondike, but flowed over into the Cook Inlet country, the American Yukon River, and elsewhere. During the summer of 1898, on the shores of the Bering Sea, a handful of inexperienced prospectors happened upon the gold of Anvil Creek. On September 20, 1898, Jafet Lindeberg, Eric Lindblom, and John Byrneson, the three “Lucky Swedes,” staked the rickets creekbeds of the Cape Nome goldfields. Nome became an instant city. Word of gold discoveries in the beach sands caused one of the West’s and Alaska’s largest stampedes. By the summer of 1900, an estimated 20,000 to 30,000 people arrived by steamer to dig the golden sands of Nome. Miner’s tents spread for miles along the Bering Sea coast, and inland hydraulic plants were introduced to wash away gravel. Nome also gained national notoriety for its violence and its corrupt Federal officials, who were later exposed and imprisoned. These events were immortalized by the novels of Rex Beach. From October to June, the Bering Sea froze, isolating the people of Nome who had missed the last boat “Outside.” In order to break down this isolation, the people focused their concern on wintertime ties to the rest of the nation. A telegraph system was constructed from Valdez across Alaska to Nome. Trails were cleared to bring in needed supplies and the mail. Between 1898 and 1908, four routes were used connecting ice-free ports with Nome. The first ran from Skagway to Dawson, Yukon Territory, then down the Yukon River to the Bering Sea coast and Nome. This 2,000-mile route, though used by express companies and the mail, was considered unsatisfactory because of its great distance and because it crossed Canadian territory. The search for an “All-American route” and the demand for a shorter haul to Nome brought into existence two aborted routes—the Valdez route became feasible via Fairbanks and the Yukon River Trail. By 1904-1905, all winter mail bound for Nome went by way of Valdez and Fairbanks. Kink Pier, Cook Inlet, Alaska - 1898 Wintertime travelers to Nome, however, still believed the shortest route to Nome would be via the Cook Inlet country. Railroad promoters had already begun construction of the ill-fated Alaska Central Railway north from Seward. In 1907, because of the development of Seward on the Resurrection Bay and recent gold discoveries in the Innoko District, the Army’s Alaska Road Commission took action. 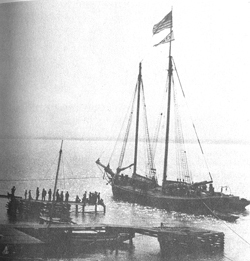 Major Wilds Richardson ordered Walter Goodwin and a crew of three to blaze a route from Seward through the Cook Inlet country and beyond to Nome. From January to April 1908, Goodwin blazed the Iditarod Trail. In a report to Richardson, he concluded that the 800-mile proposed trunkline would be feasible only if mines of value were developed, attracting additional traffic. Unknown to Goodwin, two prospectors, John Beaton and William Dikeman, had penetrated the virgin territory and uncovered paydirt in the area that soon would become the Iditarod Mining District. The Iditarod was Alaska’s last major gold rush. It was the most productive strike in a vast area, loosely termed the Inland Empire, spreading from Ruby on the Yukon River, south along the Kuskokwim Mountain into the drainages of the Innoko and Upper Kuskokwim Rivers. Prospectors had visited the area since the 1880’s, and minor stampedes had occurred up to 1907 with strikes on Ganes Creek and near Ophir. The rush to Iditarod and Ruby, between 1910 and 1912, set 10,000 stampeders in motion, while each community reached peak population of 3,000. Within two decades $30 million worth of gold was dug from these goldfields. Whereas Nome and the Cook Inlet country were easily accessible by ocean steamers, interior camps in the Inland Empire (the Iditarod, Innoko, and Ruby districts) were isolated. Stampeders bound for the mines took steamships to tidewater, then steamboats for as far as 1,000 miles up the majority of passenger and freight traffic used the river system from May to October. Freeze-up shifted traffic to the trails. Trails developed in the Inland Empire in direct response to gold discoveries. Prospectors took the natural land routes or Native routes to the Innoko mines in 1906 and 1907 and were followed the next year by Goodwin. Goodwin’s blazed and cleared Seward-to-Nome winter trail became the main winter access route to the Iditarod district. A loop trail left the main trail at Takotna and followed the creeks to the town of Iditarod, and from there north through the Dikeman to rejoin the trunkline trail at Dishkakat. A trail from Ruby to the Yukon River ran south in response to strikes made on the tributaries of the Nowitna and Upper Innoko Rivers. By 1913, an alternate trail to Nome left the trunkline at Ophir and headed north to Ruby. The musher followed the Yukon River Trail east to Fairbanks or west to Nome. These crude trails built by the mining camp residents were upgraded by the Alaska Road Commission. Congress established the Alaska Road Commission in 1905 as part of the Army’s road and trail building efforts connecting the military posts and the new mining camps with tidewater ports and navigable streams. Major Wilds P. Richardson headed the construction. The lowest level of transportation was the trail, a cleared and smoothed surface approximately eight feet wide and with no grades steeper than four percent. Along barren stretches or areas above timberline the trails were flagged. The Commission’s bobsled roads were similar to trails, except they were wider and more attention was given to grade. The few early wagon roads built by the Alaska Road Commission along the Iditarod Trail ran from communities to mining areas: from Nome to Solomon and Council, from Ruby to Long, Iditarod to Flat, Knik to Willow mines, and from Sunrise to Canyon and Six-Mile Creeks. These roads were graded and drained; corduroyed or macadamed; and further improved, enabling them to be used in the summer. Most travelers on the Iditarod Trail did not go from trailhead to trailhead—Seward to Nome—as they did on the other trails of settlement in the American West. Instead, they mushed from the ice-free harbor of Seward to the various mining districts or used the Trail segments while traveling between mining camps and trade centers. An assortment of travelers used the Trail. The majority were prospectors, trappers, or Natives who traveled—often without dogs or with one or two to help pull a sledload of supplies—to isolated cabins. A surprising number walked along the Trail. The hero of the Trail, however, was the dogsled team and driver. These noteworthies earned nicknames befitting the men who raced along the Trail carrying fresh eggs or oranges, mail or express, or shipments of gold—Frank Tondreau, known from Belfast to Point Barrow as the Malemute Kid; the famous racer John “Iron Man” Johnson and his indefatigable Siberians; Captain Ulysses Grant Norton, the tireless Trojan of the trails; the Eskimo, Split-the-Wind; and the wandering Japanese, Jujira Wada. All were welcomed in the camps and became often interviewed celebrities. The relative ease of travel along the trails during this period was made possible by the maintenance provided by the Alaska Road Commission and by the many roadhouses which once lined the Trail and its branches. During stampedes to a new gold strike, numerous impromptu roadhouses vied for traveler patronage, but after business settled to a routine, roadhouses were naturally thinned to locations roughly a day’s journey apart—approximately 20 miles. Roadhouse operators might begin business in a tent, then during the first winter build a log cabin, adding another story or an addition as business increased. Accommodations varied. Hudson Stuck stopped at a filthy, low roadhouse at Shaktoolik, where the proprietor continued his card games rather than serve patrons. Near Iditarod, he and other travelers praised the Bonanza Creek Roadhouse as the best on the Trail. The fresh meat and roomy bunks were termed luxuries. An advertisement in the Ruby Record Citizen gives an image of Cox’s Roadhouse at Poorman, a better than average stop. Besides the 22-by-30-foot main roadhouse, Henry Cox had a lean-to kitchen with running water and a dining room plus an “outside white porcelain bathtub.” A cache and ice house were nearby. To entertain patrons, the roadhouse had a pool table, card tables, and phonograph “with 40 records.” The nine single beds had springs and mattresses. Henry Cox’s Poorman Roadhouse was a place of comfort and leisure. Roadhouse proprietors faced economic problems once the stampede days passed and travel on the trails declined. Thus, a major mainstay was becoming a stop on the mail contractor’s run. The first mail contract to Iditarod ran from Nulato, on a branch run of the Valdez-Fairbanks-Nome route. 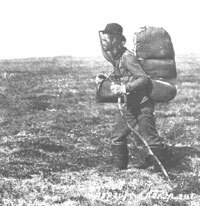 In 1914, “Colonel” Harry Revell received the first contract to carry the winter mail from Seward to Iditarod. Revell had been one of the stampeders to the Cook Inlet country in 1896. With his father-in-law, Alfred Lowell, he operated a winter mail service connecting Seward, Sunrise, Girdwood, Eklutna, Knik, and Susitna Station. With the development of the Seward-to-Nome route, he joined other Seward businessmen to boost the establishment of a mail route between the two places. Although travel between the two points was common, the mail route extended only to Iditarod. Connections with Nome were made via a short spur route from Takotna to Ruby, where the main mail run was joined. After 1918, Revell gave up the mail contract. With the end of mail runs, roadhouses began to close. The lack of roadhouses caused residents to demand protection for winter travel. A strong voice in the Territorial legislature during the early 1910’s, the representatives of the voters along the Iditarod Trail enacted legislation to aid travelers. All roadhouses were required to keep a list of travelers in order to help find the last known location of lost mushers. A territorial road commission was established to assist the Alaska Road Commissions. Funds were set aside by the territory for staking trails and building shelter cabins in order to save the lives of travelers strained by blizzards. The legislators also dealt with restrictive mining laws, moralistic change, prohibition, and other issues of the mining camps and trade centers. By World War I, the days of isolation were coming to an end. The activities “Outside” began to bear more and more on local events, especially the Great War. Young miners and workers enlisted and left the country, never to return. Money expected to be funneled into trails or mines went east. The slow construction of the Federal government’s Alaska Railroad and its anticipated aid to growth did little to stabilize the Inland Empire’s economy. Instead, many of its settlers moved to the railroad town of Anchorage. During the 1920’s, dogsled transportation was challenged by the airplane. On February 21, 1924, the first Alaskan airmail flew into McGrath. However, in 1925, the dog team and driver captured the attention of the nation for a final episode: the 1925 Serum Run. A feared epidemic of diphtheria caught the town of Nome without enough serum to inoculate the community. A wire for help went out, but plans to send an airplane from Fairbanks were thwarted by weather. It was decided to use a relay of dog teams from Nenana on the Alaska Railroad, down the Yukon River Trail to the Iditarod Trail, and into Nome. Twenty mushers carried the serum the 674 miles in 127-1/2 hours. The mushers became heroes. President Coolidge sent medals, and Balto, the dog leading the last team into Nome, was used as a model for statues of dogs in places as distant as New York City’s Central park. Despite the success of mushers and dogs during the Serum Run, the airplane would not be stopped for long. By the end of the 1920s, regular mail service to Nome was established. The Iditarod Trail and dogsledding, along with Alaska’s gold rush frontier era had gone out with a flash.